In a world of cell phones, smart phones, iPods, iPads, and other personal electronic devices, the word obsolete is the kiss of death. Without the newest gear, you may not be able to run the latest software, including the most up-to-date apps. Worse yet, being stuck with last year’s model means that the gadget’s, and therefore your, coolness factor is now gone. This, my friends, is the downside of quickly evolving technology. Vinyl records and their playback systems don’t have this problem. Firmly in the realm of “plateau” technology, the science of LP production peaked and froze decades ago with the 33.33rpm stereo format. Assuming you don’t write off vinyl playback as obsolete by definition (some do; I don’t), the advantages are compelling. 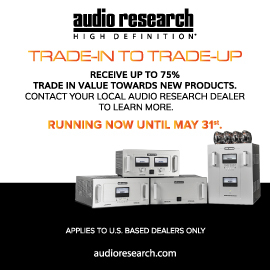 Not only are there billions of used LPs in circulation; new and reissued titles are coming out each year from the likes of Rhino, Speakers Corner, and Sundazed Records, among others. Also, compared to tape-based media, which has proven to age not at all well, vinyl (and its acetate forebears) was built to last for a very long time, if not forever. And, as we see reported from time to time in the popular press, spinning vinyl has become a very cool thing to do among hipsters both young and old. 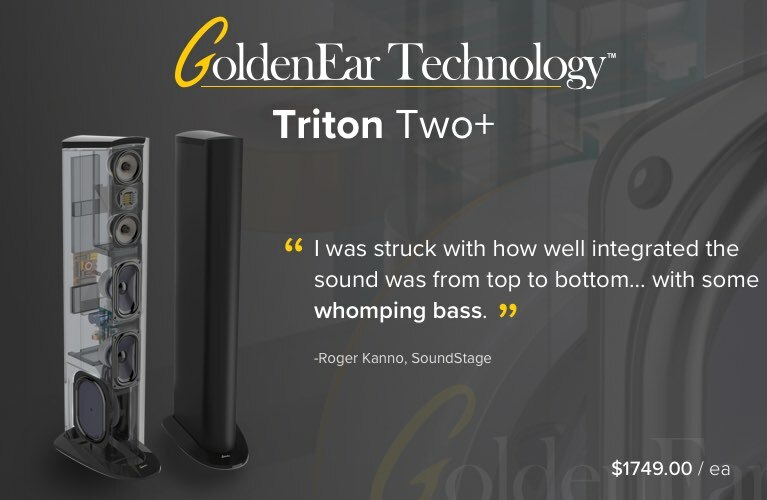 This state of affairs has not only been keeping manufacturers of turntables afloat 30 years after they all “should” have gone out of business, it is propelling them to design entry-level turntables that are user friendly and are capable of extracting the superb sound good vinyl is capable of delivering. Amazingly, all this is occurring in a post-CD world in which the reproduction of music with low noise and high dynamic range is taken for granted. The storied Thorens company appears to have stepped up to meet these challenges with the neat, and in some ways quite remarkable, TD 309 turntable ($1849.95 USD in black; add $50 for red). Out of the box, the TD 309 is as close to plug’n’play as a turntable can be, including a pre-mounted tonearm and an installed and aligned cartridge. The only things the owner need do are remove the transit screws from the suspension feet, put the drive belt on the subplatter, add the glass platter and felt mat, place a proprietary balance weight on the front left corner of the plinth, and plug in the RCA and power leads. 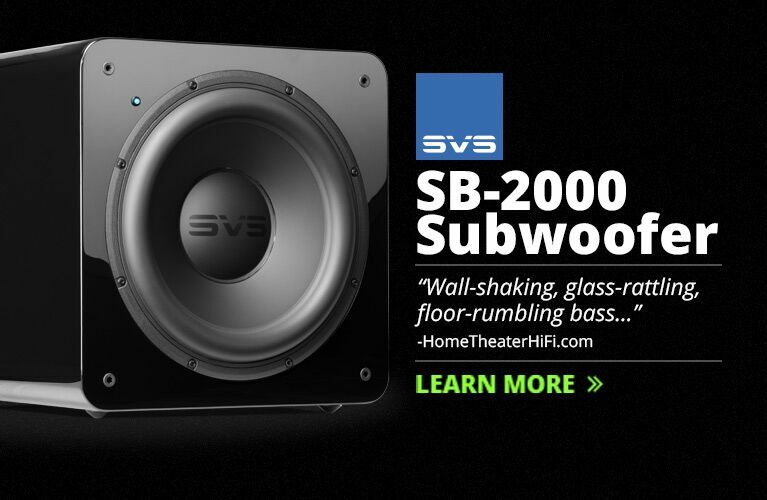 While perhaps not CD-level in setup convenience, this is miles ahead of some other turntables with high-end aspirations. Unfortunately, as much as I applaud the idea of designing a high-end turntable to suit the touchscreen crowd, I’m afraid that Thorens ultimately missed this goal. Setting up the TD 309 was indeed easy, that is until I had to adjust the vertical tracking force (VTF). Like many tonearms, the TP 92 (which is unique to the TD 309) uses a counterweight that is screwed onto a threaded post on the back of the arm. So far, so good, and quite easy to do. 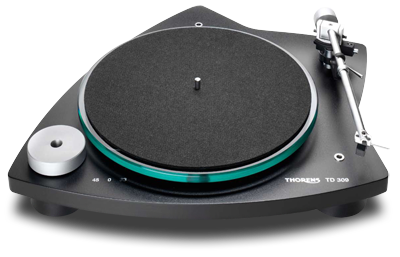 However, unlike other arms -- my AudioQuest PT in particular -- the Thorens TP 92 lacks a graduated dial on its counterweight that would allow you to visually dial in the correct VTF once the arm is balanced on its bearings. Instead, you get one of those little plastic seesaw balance scales that Ortofon would throw in with their cartridges for free. This all works well, assuming that a) the scale is accurate, and that the user b) has hands steady enough to position the stylus over the correct spot on the scale, and c) is able to do this repeatedly until the correct VTF is set. Needless to say, the excitement factor goes up exponentially with the cost of the cartridge. On the positive side of the ledger is the freebie cartridge, which I assume is sourced from Audio-Technica and which the owner’s manual refers to as the AT95B (there is no inscription on the cartridge itself); it’s quite good, and could very well satisfy until replaced with something fairly pricey. 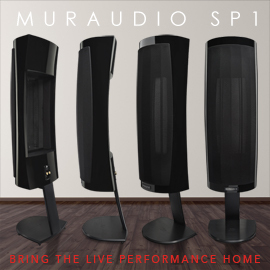 At first the AT95B sounded a bit constricted at the frequency extremes, but after about a week of service it opened up nicely, although it never did lose what I thought was a little too much midbass emphasis. This made a couple of recordings I had, especially the Band’s Anthology Volume 1 (LP, Capitol SN-16010), sound a bit murky. The TD 309 is also miles ahead of some other turntables in the looks department. My review sample’s plinth was dressed in a very attractive shade of red (black is also available) that nicely set off the natural metal finish of the tonearm and large counterweight, which from some angles look like sculptures in a Lilliputian museum. 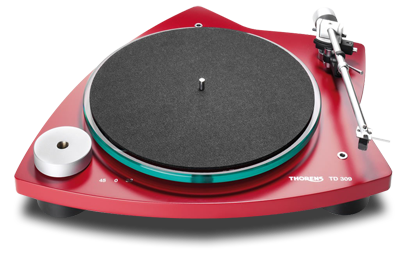 Whether or not you find the “family crest” shape of the plinth a stroke of genius or simply Thorens’ effort to differentiate the TD 309 from the dozens of same-styled turntables out there, it is the natural result of cutting away any mass that is either not sitting directly on a three-point (rather than four-point) chassis, or is otherwise necessary to support the tonearm. Since nothing else was required from a performance point of view, the pared-down shield shape was the result. This design philosophy of cutting the fat extends to the dustcover (there isn’t one) and the tonearm, the latter as seemingly simple a design as you can imagine: a hollow, nontapered aluminum tube. The collar at the middle of the arm is a resonance-control device that should not be moved. The bearings, made in Japan, appear to be of very high quality, and magnetic antiskating is employed. Just about anything you’d ever want to adjust is adjustable on the TD 309. The belt tension, level, 33.33 and 45rpm speeds (individually), vertical tracking angle, overhang, downforce, azimuth, and antiskating all look fairly easy to tweak. Strangely, the minimalist headshell doesn’t permit the adjustment of lateral tracking geometry, which is fixed at 23.6°. All I can say is that the geometry chosen didn’t conflict with that of my Shure setup jig. The effective mass of the TP 92 tonearm is a moderate-to-low 11 grams, which worked well with my Shure V15 V-MR cartridge -- though the arm’s antiskating was barely able to contain the Shure’s admittedly very light VTF of 1 gram. Weighing only 6.5 kilograms (14.3 pounds), the Thorens was well suited to the plinth of my wall-mounted Target turntable shelf and, unlike my generously sized VPI HW-19 Jr. -- which barely fits on the Target -- the TD 309 had plenty of room to spare. Even before I played the Thorens, I must say that it beat out the VPI rig in user-friendliness. Over the years, I’ve gotten used to having to spin on a record clamp with every play, or move the drive belt from one motor-spindle groove to another simply to play a 45rpm record. Long ago I chalked this up to the dues that must be paid by any red-blooded audiophile -- hey, it’s not exactly like having a tooth pulled. But having played with the Thorens, I now have real trouble justifying all that exercise. With speed selectable through a switch front and center and no record clamp, I found myself quickly sailing through LPs, smiling all the way. And what did I hear? At first, nothing. This was one quiet turntable. Again, having grown used to the VPI’s much higher noise level, the difference I heard was dramatic. Of course, a lowered noise floor should also translate to greater dynamic range, and that was the case with most recordings I listened to. 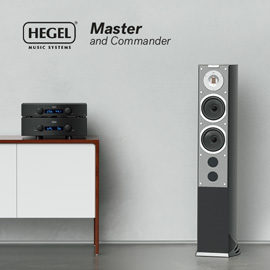 An audiophile raised on CDs should not be disappointed. And this was true of both newer and well-worn favorite albums. The latter included my copy of Walter (later Wendy) Carlos’s The Well-Tempered Synthesizer (LP, Columbia Masterworks MS 7286), from 1969. This second album from the Moog synthesizer pioneer -- best known for the soundtracks to A Clockwork Orange, The Shining, and Tron -- comes as close as any analog medium could to displaying the dynamic power of this then-new and mysterious instrument. The opening notes of the Allegro of Bach’s Brandenburg Concerto No.4 jumped out of a blackness that, if not quite CD-like, was damn close. The drama of sound emerging from nothing also made for a very entertaining spin of my 30-year-old pressing of Pink Floyd’s Animals (LP, Columbia JC 34474), in which the effect of the gradually-emerging-from-silence guitar strumming in “Pigs on the Wing (Part One)” was nicely and convincingly displayed. The 1980s, being the crossover decade from mainstream LP to mainstream CD, produced at least two recordings in my collection that were released simultaneously or almost simultaneously in both formats. While I’m not about to say that these recordings are the ultimate in sonic potential, they do demonstrate the sound qualities commercially available at the time. I use them here only to show (for any who still doubt) how good LP playback can be compared to the “perfect sound forever” propaganda that was then sweeping the industry. While my LP copies were well loved during their lives, they’re still in good shape, with no serious scratches, and reasonably quiet. I began with Peter Gabriel’s 1986 masterwork and his most successful album, So. Apart from lopping off a track (“This Is the Picture,” with Laurie Anderson), the LP edition (Geffen GHS 24088) differs from the CD (Geffen 9 24088-2) in having a balance that favors the bass and drum work over the latter’s higher-frequency percussion. While these differences were plain, I’m at a loss to know which result came closer to Gabriel’s intention, and therefore which version is more accurate. Ultimately, I preferred the LP played through the Thorens, which presented in more detail Tony Levin’s exquisite bass lines, and which trounced the CD in the imaging department, where voices were better fixed in space. Paul Simon’s Graceland (CD, Warner Bros. 9 25447-2) was another 1986 album, from which three tracks appeared on Simon’s Negotiations and Love Songs 1971-1986 (LP, Warner Bros. 9 25789-1). Here it was much more difficult to hear meaningful differences between the CD and LP tracks of “Diamonds on the Soles of Her Shoes,” although, again, I give the nod to the vinyl for generating more convincing spatial effects, especially in the a cappella opening sung by Simon and Ladysmith Black Mambazo, in which each voice was well localized. Surprisingly, knowing that CD is the quieter medium, this quality never in itself augmented my listening enjoyment over that of the LP when played on the Thorens rig. Could I hear the groove noise between tracks? Sure. When the music started, did I care? Never. Aside from everything else, a big difference between spinning LPs and spinning CDs is that the sound energy put into the listening room can be hard for a turntable to ignore. 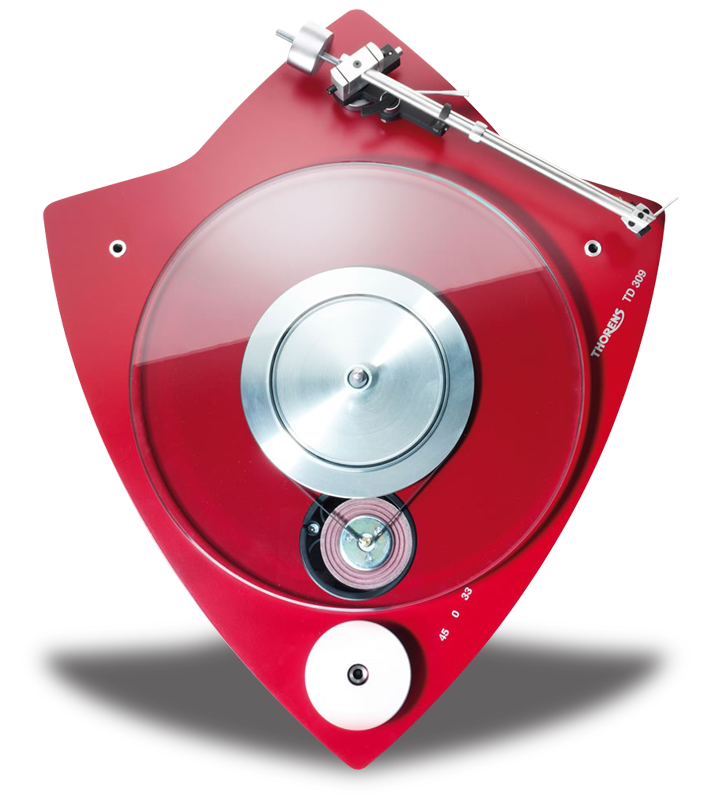 A great challenge to designers is to come up with a turntable that allows the pickup cartridge to focus on the vibrations imprinted in the record grooves while ignoring airborne and room-borne energy. 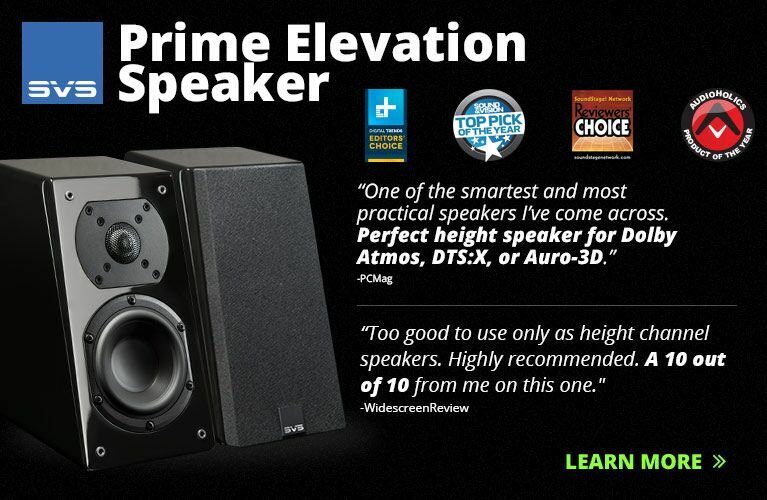 Systems that do this well allow for low-distortion playback at realistic sound levels. To hear how the TD 309 performed in this regard, I put on Bach’s Trumpet (LP, Philips 6500925, circa 1975), a lovely pairing of organist William Neil and trumpet virtuoso Don Smithers that showcases the sheer acoustic power of these instruments. Gottfried Reiche’s Abblasen is a superfast fanfare written by the principal trumpeter of J.S. Bach’s Leipzig orchestra. At natural (high) volume levels, each up-tempo 16th note was clearly delineated, and at a more realistic volume level than I ever attempted with my VPI rig. This excellent isolation from room vibrations also allowed me to more fully enjoy the blooming pedal notes in Bach’s “Vom Himmel hoch, da komm’ ich her” (BWV 738). Here, realistic volume levels could be approached while intonation remained very solid -- with my reference rig, I can’t have both at once. I love vinyl records, and have no reservations about expounding their sonic potential to anyone who will listen. However, I try not to make blanket statements like “LP is better than CD.” First, this may or may not be true: anniversary reissues of CDs, for instance, may have received the kind of care in all steps of production that the engineers and producers of the original LP never thought possible or, indeed, necessary. The new Beatles CD releases in stereo and mono are excellent examples. 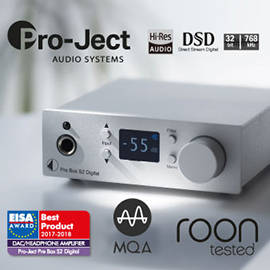 Further, LP playback systems must be of a sufficient quality to allow the “magic” of the LP (or some LPs) to come through. I can’t put an entry-level price point for such a system, but I can say that, at its price, the Thorens TD 309 should not have too much competition. An excellent job all around.